We received a review copy of 47 Meters Down to help with creating The Sinking Feeling. Fall is officially here! You know what that means? Halloween is soon upon us! At Geeks Who Eat Headquarters that means it is time to start thinking about horror movie inspired recipes (not like we aren’t thinking about them all year). 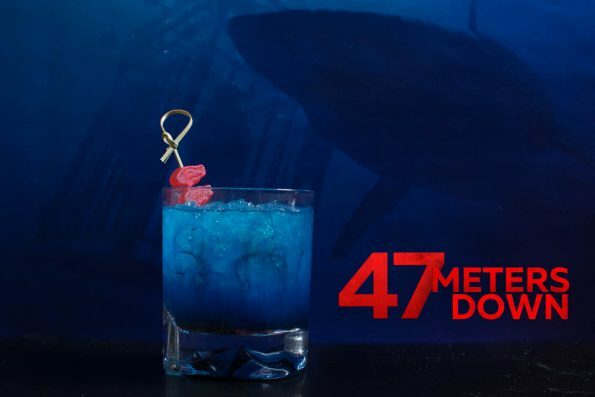 We’re jumping into the water (pun intended) with a cocktail inspired by the latest in shark horror, 47 Meters Down. 47 Meters Down is a new take on the traditional shark movie. Therefore, we wanted to create our own version of the classic Shark Bite cocktail. 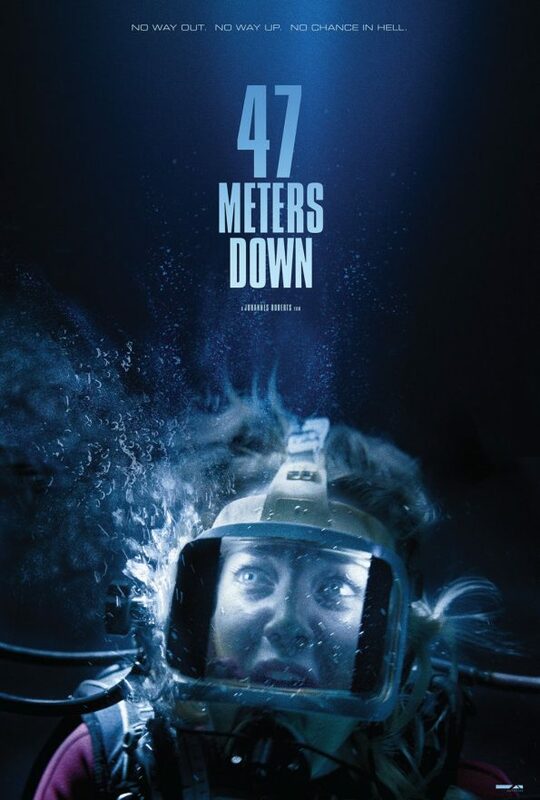 In 47 Meters Down, sisters Lisa (Mandy Moore, ”This is Us”) and Kate (Claire Holt, ”The Originals”) become trapped at the bottom of the ocean when a diving expedition to observe sharks goes horribly wrong. When the cable attaching the cage sinks to the bottom of the ocean, the sisters must figure out a way to get back to safety battling injuries, lack of oxygen, and worst of all, bloodthirsty, great white sharks. We actually really enjoyed this movie. Sure, it suffers in parts from a lack of realism, but what horror movie doesn’t? The fact that the movie takes place almost entirely underwater is really unique to the genre. Also unique, is the lack of gore. For once, 47 Meters down is a horror movie that doesn’t suffer from a PG-13 rating. Now onto the cocktail! The Sinking Feeling is a riff on the classic Shark Bite cocktail. 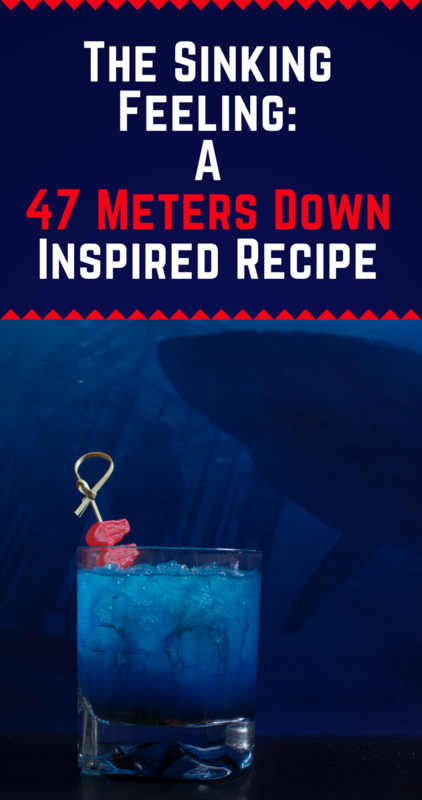 Much like 47 Meters Down is a new take on the shark horror genre, we wanted our cocktail to do the same. Instead of rum, we used mezcal to tone the sweet factor way down. Also, instead of focusing on the grenadine as blood, we let it sink to the bottom creating the look of ocean depth. We hope you enjoyed our mini-review and recipe! What is your favorite horror movie featuring a shark? Let us know in the comments below or tag us on social media! Also, be sure to visit all through next month for a TON of horror movie inspired recipes! 47 Meters Down is now available on Digital HD, DVD, and Blu-ray! Combine first 3 ingredients in a shaker. Add your desired amount of grenadine (don't add too much or it will not taste great). The Geeks were provided with a copy of 47 Meters Down for research purposes. Images and title treatments were used with permission. All opinions are wholly our own. View our Disclosure Policy for more info. Ya, young women at the bottom of the ocean, no one around, sharks…what could go wrong? Classic! lol This cocktail is definitely spooky with it’s fun deep moody blue color. Perfect for this movie or a Halloween party. I love this! and perfect for spooky parties coming up too. That movie sounds like my worst nightmare! I’m already terrified of seaweed touching my foot when I’m in the ocean….anyways. lol That drink sounds delicious and I love the blue color. I love this time of year for all the spooky recipes that turn up. And this looks exquisite! And scary! This sounds like the perfect drink. What a great sounding movie! I’ll have to check it out! Super cool looking cocktail. It totally reminds me of deep water and would be perfect for Halloween. Shark week was a huge part of my childhood. My brother was more into it than I was, but my mom ended up enjoying it too. The drink looks awesome though! Thanks to my recent MtG cocktail recipes, I even have most of that on hand already! Except for the Mezcal; I had to look that one up as I’d never heard of it. My interest has been piqued.